Why is this? Traditionally, people in the Facilities Management sector have often ‘fallen into’ the industry, explained the FMJ (Facilities Management Journal) in their ‘From the tools: The Making of the Manager?’ feature (March 2017). Our facilities managers could have worked their way up from frontline positions such as cleaning, catering, engineering or security. Increasingly, we can also see academic graduates choosing facilities management roles, too. To become a facilities manager, the UK’s National Careers Service website simply states that “there are no set requirements, but you’ll usually need a qualification in facilities management.” Once you become a facilities manager, bodies like the British Institute of Facilities Management and Royal Institute of British Architects can provide training and CPD courses, but it is all optional to development – there is no legal requirement to train. Of course, diversity in our industry is welcome, and diversity is known to bring outside-of-the-box solutions. However when we start comparing the two professions, we can start to see how gas engineers will be ‘singing from the same hymn sheet,’ whereas our facilities managers could be working from all manner of different pages. For the future of facilities management, this very diversity could potentially be harming our buildings, and our occupants’ wellbeing, as opposed to aiding them. We could be creating an environment where knowledge levels, procedures, best practices and the way building hardware solutions are selected is all different and varied. We are now coming to a stage in the door hardware industry where development is rapidly overtaking existing knowledge. Electro-mechanical ‘smart’ hardware means the ability to unlock doors from phones, control access to secure areas and remotely lockdown, these are all functions that would be greatly beneficial in any facility manager’s life. 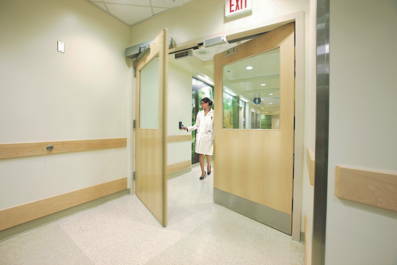 A case in point happened as recently as 2016, when a fire door in a hospital that was fitted with a self-closing device shut on an elderly patient, causing injury. Unfortunately, this injury contributed to that patient’s death. Intended to be an aid for the door, it has instead caused accident and a tragedy. After the case, the Department of Health suggested that risk assessments should be carried out on all fire door closing devices to assess appropriate closing times, taking into account the occupancy of the building. For facilities managers who are ‘self-taught’ and have little knowledge in these electro-magnetic devices and risk assessments, we can immediately see how ongoing training in this area will benefit them. Margaret Chan’s daughter got her finger caught in the heavy fire door at Cuddington Croft Primary School in Cheam, Surrey. The incident is claimed to have occurred after the child was left unattended after being “sent back into the school building toilet alone unsupervised via a classroom where there are two fire doors”, said Margaret. The school could not tell the mother what had happened, as the incident was ‘unwitnessed’ (Daily Mail, 2015).